Design.Create.Inspire: Right Brain or left? I just absolutely love this ad for Mercedes Benz. It also made me curious about what side of my brain I use most. So I took a fun little test online and discovered I'm 51% right and 49% left brain. What that exactly means?? 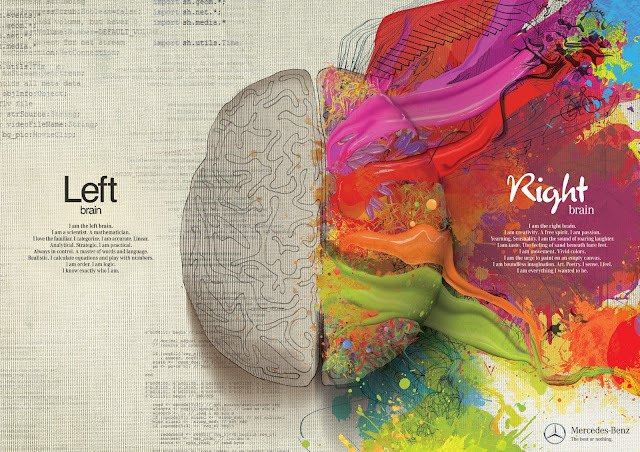 I don't really know :) But I do know I love this image and wanted to share it with you all and ask - what side of the brain are you? What an fun question! When I saw your 51/49 score, my first though was of the white wreath you designed for a Gypsy contest ... now that was a balance of art and engineering!! I just took the Art Institute of Vancouver quiz ... I'm 55 right and 45 left. Like you, I'm not sure how this knowledge will effect me, but some of their analysis was spot on. Thanks for giving me something interesting to think about today.